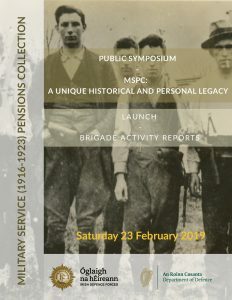 On Saturday 23 February 2019 the official launch of the Brigade Activity Reports series of the Military Service (1916-1923) Pensions Collection took place at Cathal Brugha Barracks, Rathmines, Dublin 6. These reports were compiled from 1935 onwards to assist in the verification of individual applications for pensions; nearly all of the reports include brief descriptions of particular operation undertaken or planned; the date of the operation and its location; and the identity and role of those who participated. The launch was accompanied by a public symposium, compèred by Catriona Crowe and featuring Anne Dolan (TCD), Leeann Lane (DCU), Fearghal McGarry (QUB) and Donal Ó Drisceoil (UCC). A new publication, a Guide to the Brigade Activity Reports was also be released to mark the event and was made available to each attendee; a copy can also be downloaded here free of charge. Explore the Military Service (1916-1923) Pensions Collection Brigade Activity Reports online.